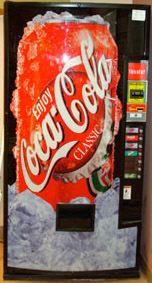 Save more - Avoid the vending machineEliminate The Muda! Here is an easy and short one for today. Avoid the vending machines. Vending machines are not cheap and this additional overhead and expense must be covered by the revenues companies take in. Depending on location I have seen 20 oz. bottles of soda priced as low as $1 (rarely) and as high as $2.50 in some hotels. In terms of $ per gallon that’s $6.40 – $16.00 per gallon! And we get upset at the price of gas? That’s crazy money when you compare it against cases purchased from the store. I often buy my favorite, Dr. Pepper, while travelling for around $5.00 per case of 12 – 12 oz. cans. At this rate I am paying $4.44 per gallon. Still not as cheap as gas but a quarter the price of the highest priced vending machines. Snacks are another money burner. Consider these newer 100 calorie bags. Yeah makes us feel great because we are consuming less, but according to the Center for Science in the Public Interest in study they conducted we are paying between 16% and 279% more for the convenience of having little bags. Ever eat those 100 calorie bags? Eating just one makes me want another! Avoid the machines! Buy your snacks in advance and break them into realistic portions. Use reusable containers or ziploc bags and carry a snack with you. Spend less, save more and get rich in the process. Does this make you think of another money saving opportunity? Please share it! Comment below.